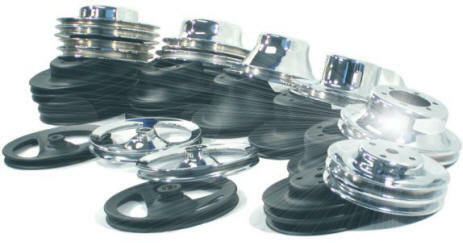 Do you have bent, broke, or just cannot find the correct Chrysler Pulleys to complete your project vehicle? Well once again, BPE has solved your problems. In a major undertaking, we have manufactured reproduction pulleys of the original Chrysler styles and are now available for all the popular applications, including all Big Block combinations, with or without power steering or air conditioning. We also make 1970 and later Small Block Pulleys, with aluminum water pump, with or without power steering. Also available are Power Steering Pulleys for power steering pumps on B/RB/Crate Hemi/Street Hemi/5.7L Hemi/WK Magnum applications. Most of these items are available in black satin finish (just like originals), or chrome!